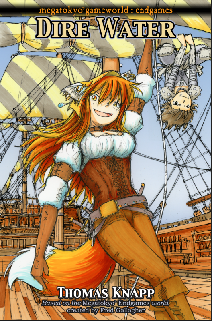 Life as a fox-girl is never easy, especially in the land of Avalon after the revolution. Scorned by deposed nobles who consider chimeras like her bastards, and by the new republic forces who regard those same children as remnants of the old abusive nobility, it’s a day to day struggle just to be able to wake up the next morning. So when fate puts young Sunay out on the open seas beyond the reach of political forces, it opens up an entirely new world to explore… a world that is under siege both from internal conflict as well as the dire waters of the Void. The second Megatokyo: Endgames novel is live and for sale! For dead tree, follow this link. And for Nook, you can click here. It's somewhat of an open secret that Fred has taken an opportunity to begin work in earnest on his old pre-MegaTokyo story, Warmth. Originally set in Sendai, Japan, Warmth involved the American Tom (nicknamed Tomu, for Japanese phonetics) and main girl Saeko. In the early days of MT, Fred often referred to it as "practice for Warmth", to hone his art and comic skills so he could do his more favored story justice. Ultimately MegaTokyo borrowed several plot elements originally conceived for Warmth. Warmth appeared briefly in something close to its original form in an issue of the ill-fated "Amerimanga" magazine from the ill-fated Studio Ironcat. Years later, Fred decided to move the setting of Warmth to Michigan, with its much more familiar area and culture, and also since MegaTokyo had pretty much already played out the "American guy in Japan" theme for him. (This was shortly before the earthquake in Sendai, which will always hold a special place in Fred's heart as the original "home" of Warmth.) This also necessitated a name change for Saeko, and the overall storyline continued to change and evolve in interesting ways. Anyhow, a few nights ago Fred wanted to look up some of his older Warmth development sketches, and decided to do it live on camera over his twitch.tv stream. Since he wasn't quite sure which sketchbook he was looking for, he went through an entire stack of them, much to the delight of the viewers. The recording of this stream is available for a short time at twitch.tv, and Fred has also put it up on YouTube. Since Fred streams without a microphone, the chat for the stream served as a bit of a running commentary on what we were looking at. I've condensed the log of that chat down to the important bits, and adjusted the time stamps to match the elapsed time marker on the recordings. So crank the video quality all the way up, set it to full screen on the largest monitor you have, and read along for our trip down memory lane for MegaToyko, Warmth, and more. Of course this means that Fred is now splitting his time between Warmth, the MT VN game, and the MT comic itself. Things are progressing, even if it doesn't look like it. The traditional between-chapter omake should turn up at some point, and Fred's doing something a bit unique with it. There also may be some DPDs soon to help bridge the gap. On an unrelated note, in the recent drawing of Komugiko in leaves that was used for the blanket a few months ago, her pose reminded several of us of the Firefox logo. So I decided it was entirely appropriate to use it to create a Mugi theme for Firefox. If you like it, enjoy!